As one of the oldest forms of jewelry, pearls have been held in reverence and esteem in almost every historical culture. Ancient Vedic text speaks of pearl as the “daughter of the moon,” born in the earth’s waters. Natural pearls used to be widely traded, but because of climate and economical changes, they have all but been eradicated from gemstone markets. Fortunately, with the contribution of cultured pearls, they still remain a viable form of adornment and astrological gemstone. While there are many types of cultured pearls, not all of them are suitable for Vedic astrology. In fact, most cultured pearls are not going to have the desired effects because of the components that have gone into the culturing process. 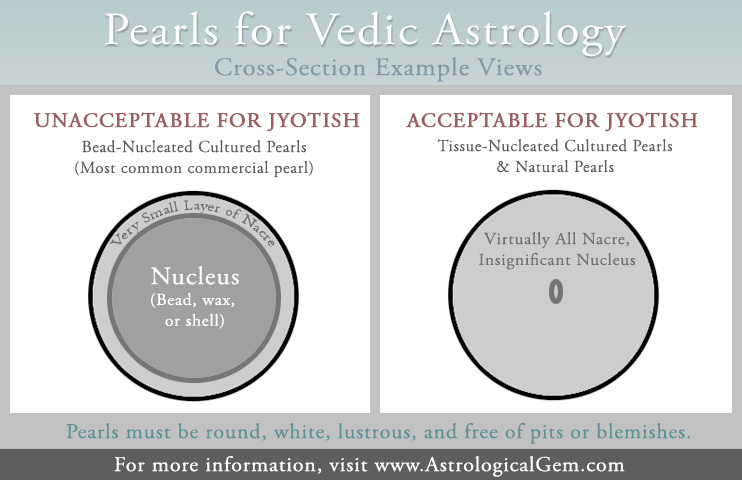 In order to understand what works for Jyotish and what doesn’t, it is important to understand exactly what pearls are and the process that goes into forming them. The process for creating a cultured pearl, versus a “natural pearl,” is varied only by human intervention in the process. Pearls are formed when a foreign object gets inside a mollusk and creates an irritant in the soft tissue. The mollusk then secretes a layer of nacre over the foreign matter, which builds into a pearl. Nacre is the actual pearl substance. The quality of the nacre is one of the most important factors when evaluating the quality of a pearl for astrology. The “nucleus” is the center of a pearl. One of the most important distinguishing characteristics in a cultured pearl is the type of nucleus being used. The most common type is a bead nucleus. This means a bead is inserted into the mollusk, which in turn, coats the bead with a thin layer of nacre. Types of bead nucleated cultured pearls include Akoya, South Sea, and Tahitian. Because bead nucleated pearls have such a small percent of actual nacre, they are not considered ideal for Vedic purposes. Chinese tissue nucleated pearls are the best option for Vedic purposes as they are actually formed entirely of nacre. A tiny piece of mantle tissue from another mollusk is inserted into the mussel, which results in the formation of a pearl. Because they are not given a pre-shaped bead to start with, only about 2% of these pearls are round spheres. 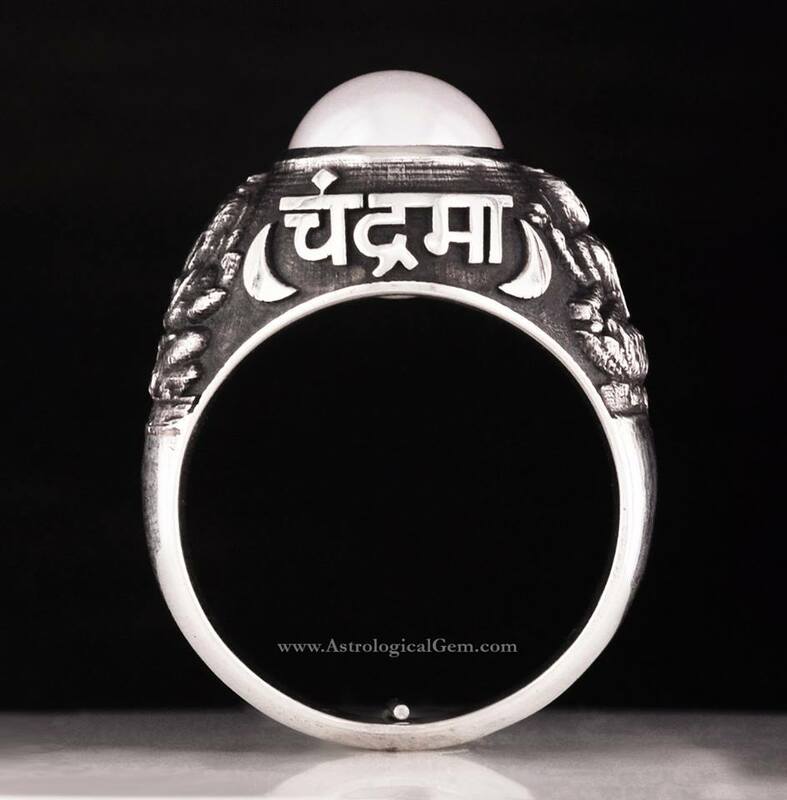 Those that are round, white, lustrous, and blemish-free are very powerful for Jyotish. A keshi pearl is an accidental by-product of the pearl culturing process. They form in the mollusk of a farmed pearl, but not where they were intended to form, so they don’t have a bead nucleus. They are a suitable option for Vedic astrology if they meet the quality requirements. 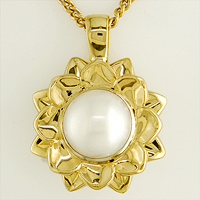 Since keshi pearls rarely form in round shapes, they are not usually suitable for astrology. 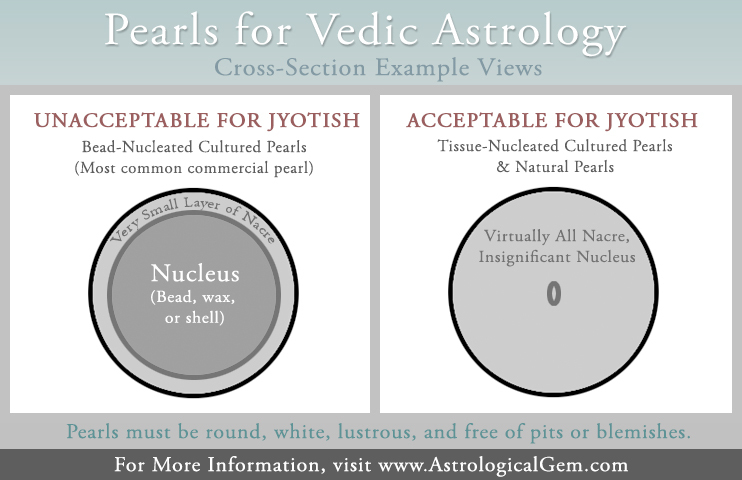 A Vedic pearl should be undrilled, round, white (undyed), and free of any surface imperfection in order for it to have the purest and most powerful Moon energy. Tissue nucleated pearls should be at least 4 carats to get the best results, although ideally something in the 6-10 carat range will have the most effective energy. At Astrological Gem, we hand select every pearl we buy in order to guarantee the highest quality selection and best results for our clients. You can read more about how to care for your pearl here.